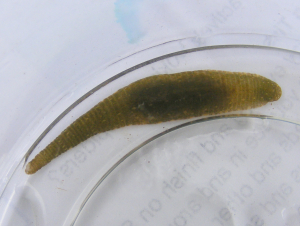 Observation - Leech - UK and Ireland. Description: suckers at both ends. Brown colour with stripes on back, caught in slow moving water. suckers at both ends. Brown colour with stripes on back, caught in slow moving water.